TWO WEEKS BEFORE THE CONVENTION! A mobile app will be available for the Convention. It will have all the information you need to get the most out of your convention experience. 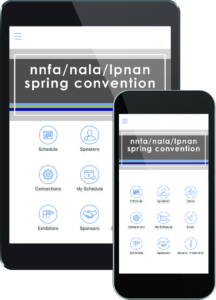 The mobile app will be available approximately two weeks prior to the convention. Registrants will receive an email with instructions on how to access the app. Be sure to provide your email address on the registration form and watch for the email in your inbox! Registered attendees can download convention education session handouts online! Session handouts will be emailed to registrants 7 to 10 days prior to the convention. Not all session will have handouts. Be sure to provide your email address on the registration form. Printed handouts will not be distributed onsite. Prior to the convention, attendees can print handouts for the sessions they plan to attend. Handouts can also be viewed on the mobile app during the event.